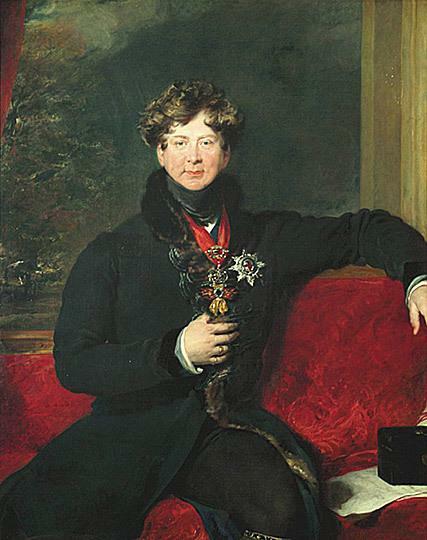 On this day our infamous King George IV finally ate and drank his way into the grave, leaving behind a less than enviable reputation that follows him to this day. His reign was one of opulence, extremes and a life lived in the full gaze of press and public and today, we are a little muted here in the salon as we mark the anniversary of his death. On the night of his death George retired to bed in the company of his friend, Sir Jonathan Wathen-Waller, where he slept fitfully. He woke in the early hours of 26th June 1830, breathless and in such pain that Halford was summoned immediately. As the doctor hurried to the room, George gripped Wathen-Waller's hand and told him, "my boy, this is death". At quarter past three that morning, the last King George of the glorious Georgian era passed away. "There never was an individual less regretted by his fellow-creatures than this deceased king. What eye has wept for him? What heart has heaved one throb of unmercenary sorrow? ... If he ever had a friend — a devoted friend in any rank of life — we protest that the name of him or her never reached us." A sad end to a life that might have had great significance. Thanks so much for the thoughtful post! A pleasure; thank you for visiting! Poor man! I know he was fickle and had many vices but doing research on another monarch, the bourbon Louis XVIII, I discovered that when he sought refuge in England [having been rejected by all the European royal families for fear of Napoleon], George IV, Prince Regent at that time, granted Louis permanent right of asylum and a generous allowance. So he had some good qualities. George certainly did have some very good qualities; unfortunately, his reputation has become somewhat overwhelmed by his largesse! His largesse and his proclivity to spend... it is a little much to expect the people to pay for a crown encrusted with how many diamonds? 30,000? If I remember correctly. And so the diamonds were rented for his coronation, but he protested their return, wanting the crown kept that way. The country rented the diamonds for a few years before finally ignoring his wishes and returning them. And then there was the marriage. Ah, the Coronation is one of my favourite George topics! No matter his vices and faults, I hope he had at least one friend. Life without a single friend is a very sad thing indeed. He did have some very close friends; I'm glad one was with him when he died. I have this discussion of the virtues and vices of George IV far too often, especially for an American, but I am a little muted as well, reading this. He has been, if nothing else, good fodder for romance novels. I think his main fault was self indulgence. He didn't seem to know anything about restraint or self sacrifice. He never had the respect his father did. He behaved abominably to his wife and even was a tyrant to his daughter. He seemed to lack empathy. I think Mrs. Fitzherbert really loved him and was a good influence on him but he allowed others who catered to his less pleasant side to influence him. It is rare that a newspaper make such a bald and unflattering statement about a ruling monarch. He was an ego running wild! Reminds me a bit of Errol Flynn. He once said something to the effect of that he'd rather enjoy life and party and die young than to take better care of himself and live to old age. And that's what happened. He died decades ago, and his old costar in many movies, Olivia deHaviland, is still going strong. I don't know if George IV had the same attitude, but just the overindulgence and sad, too early ending is similar anyway. I think you may have hit on something there; George certainly didn't think too far ahead when he was living the high life! If nothing else, I have to be grateful to George IV for building the magnificent Royal Pavilion in Brighton, which delights my eye as I walk past it every day, and for starting the process that has made Brighton one of the most interesting and exciting places to live today. A truly stunning building, how lucky you are to see it every day. I shall be reading from my book at an event at the Royal Pavilion on 4th September. It's possibly my favourite place in England, so I can't wait!